If dust is mostly seen as a theologically charged object on a classically painted canvas, in the universe of technical images it is regarded more as an unwanted intrusion. We have all seen the dust bunnies on a photographic print from a negative, but even the sensitive photochip of today’s digital camera is not immune to dusty interventions. Attempts to capture this intruder in technical images have been few and far between. We instinctively think of Man Ray’s 1920 photo of Elevage de Poussière , who ‘bred’ dust on the reverse side of his Large Glass. But, up to now, no one has come as close to the phenomenon of dust as has Achim Mohné in his series of Lasergraphs begun in 2004. That he has approached this intruder with the medium of the photogram is no accident but, for the Cologne artist, evolved almost as an inner necessity. Achim Mohné has been on the trail of dust for some time now. With large-scale spotlight installations he had already illuminated its finest particles. In Aufzeichnungen für das Kellerloch (notes for a cellar), realized in 2000 at Museum Ludwig, among others, the dust was the sole light-choreographed protagonist and advanced to a “hyperactive starry sky“. The Fireflies, which Mohné subsequently produced in 2000 as a mobile installation in the Southern California desert, became the brightly lit center-of-attraction for rain and insects. The actualization of the Fireflies i to accommodate an indoor installation at the ZKM Karlsruhe for the exhibition Iconoclash ended by having to breed its own luminous subjects. Thousands of specially-raised grain moths whirled in the beam of light from a high-powered projector and created an amorphous raster of living points of light in the filmed video projection. These temporary installations Achim Mohné also captured on camera, whose appeal lies primarily in the smudged traces of the insects’ movements. On the other hand, he was dissatisfied with stills of the insectless powdery light cones and thus looked for alternative ways to set inert dust into a technical image as his soloist. He then remembered the shadow technique of the photogram he once used and set so extraordinarily into a performative context as long ago as 1996 with Soma Semeion Syllogo . But now instead of the human body, dust was programmed to cast its shadow. Instead of large black-and-white rolls of photo paper, sheet film smaller than a postcard were to be the stage on which the cast shadows were fixated. The dust is thus virtually shot or sideswiped by light and transformed into images. Achim Mohné’s weapon of choice is the coherent beam of a laser. From the side, a beam measuring around 1 mm grazes over the surface of the 4” x 5” slides and negatives. The dust particles in the line of fire are literally charged with highly focused light. Via static electricity, the dust lands on the sheet film automatically when the film is taken from the package and, if need be, Achim Mohné may sprinkle on more. Out of such close combat with light, results emerge in color or black-and-white with cosmic effects that are unrivalled. Achim Mohné’s work on photograms of his shadow-casting dust protagonist knows few counterparts. Dust as the main agent played a key role in Adam Fuss’ photographic process merely as a means of finding stylistic expression. In 1986 and only by accident did the British artist Fuss even discover the photogram using a pinhole camera. Through a crack, light fell unintentionally into the dark box and from the side lit up not only the 8”x10” slide film, but also created an extraordinary light and shadow scenario of the dust found on its surface . Adam Fuss himself called this work one of his best and most important pieces, but quite remarkably did not pursue this line any further . Achim Mohné's Lasergraphs take Fuss’ gently modulated shadow picture several steps further. The focused light creates more than the shadows of dust: the laser incites the single dust particles not only to leave dark shadowy deposits, but electrifies them into luminous bodies that, in turn, irradiate the surrounding field and colorfully deflect the light. But also his procedure of enlargement distinguishes him fundamentally from Adam Fuss who thought that the nature of a photogram was meant to be on a one-to-one correspondence in size with the original. It is exactly through blowups that Mohné breaks away from this rather cherished dogma and the metaphysical tendencies of the discourse on traces. He thus frees our view for the spatial qualities of distance and proximate contact. The dust particles go on to become a knot in a complex configuration of light and other particles. Drühl, Sven: Achim Mohné - Zeitverschiebungen und Beobachtungen zweiter Ordnung, in: Kunstforum, 151 (July-September 2000), pp.146-151, here p.147. Weibel, Peter; Latour, Bruno (ed. ): Iconoclash, Cambridge 2002, p.684. KHM Köln (ed. ): Achim Mohné, Arbeiten 1996-98, Köln 1998. Parry, Eugen in: Fuss, Adam: Less than a tast of earth, Santa Fee 1987, pp.1-28, here p.8-9, Plate 43. 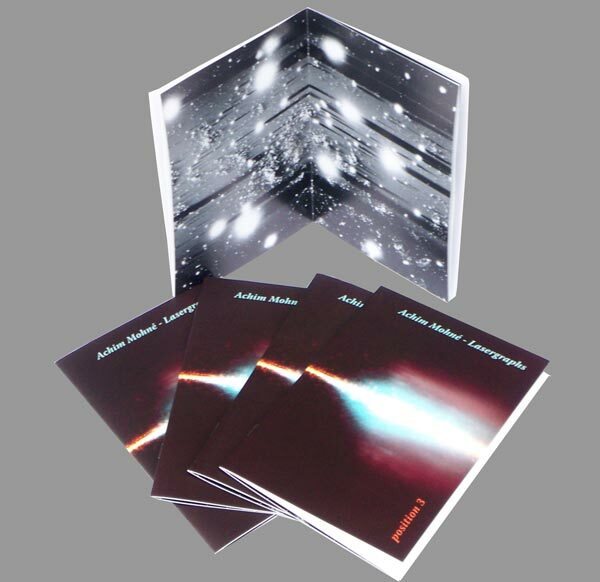 Adam Fuss spoke on this subject with the author on a tour of his solo show in Winterthur 1999. 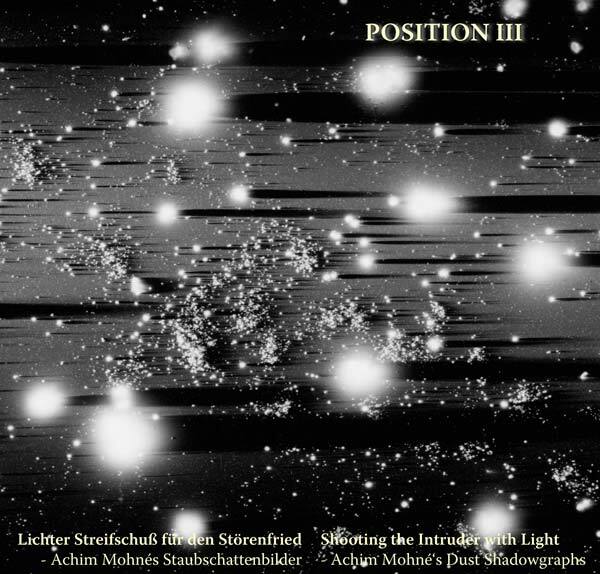 Get POSITION III as print edition or view and print it as .